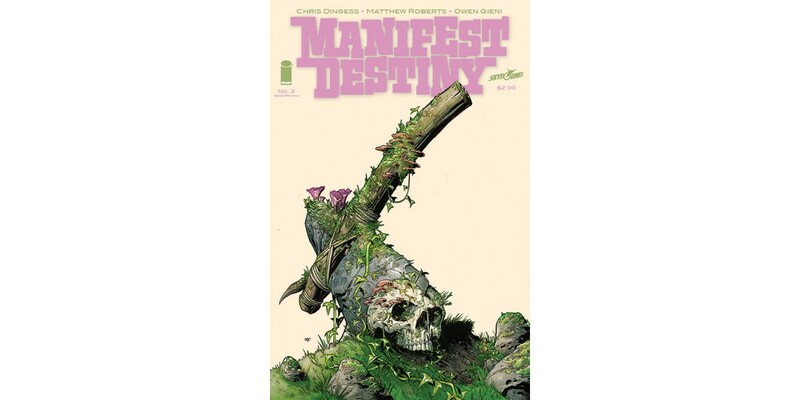 The second issue of the exciting new series MANIFEST DESTINY, by writer Chris Dingess (Being Human) and artist Matthew Roberts (BATTLE POPE), has inspired the imaginations of readers, hooked critics, and sold out instantly at the distributor level. In MANIFEST DESTINY, Lewis and Clark adventure into the unknown, in an America where monsters and mysterious creatures roam freely, picks up with the crew discovering something even more frightening than a… well, Buffalotaur. MANIFEST DESTINY will take readers to the New World and into the unknown for a pulse-pounding adventure. MANIFEST DESTINY #2 has completely sold out at the distributor level, but may still be available in comic stores, and is currently available digitally on the Image Comics website (imagecomics.com) and the official Image Comics iOS app, as well as on Comixology on the web (comixology.com), iOS, Android, and Google Play. Image Comics is pleased to announce that this second issue will be going back to print to meet customer demand. The second printing of MANIFEST DESTINY #2 (Diamond Code NOV138097) will release on 1/8/2014. The second printing of issue #1 is also available with Diamond Code OCT138101. MANIFEST DESTINY #3 releases 1/8/2014 and is available for pre-order with Diamond Code NOV130508.